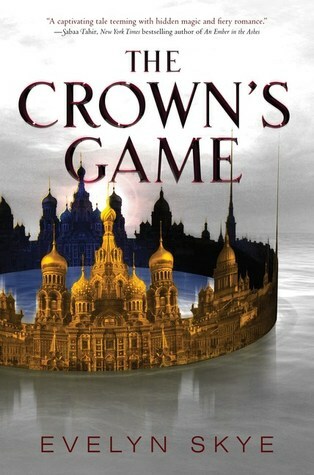 Today, to start off this new feature AND to celebrate the paperback release of The Crown's Game is Nikolai Karimov from Evelyn's Skye's The Crown's Game to answer a few questions from concerned readers! I got a speeding ticket the other day but my friend always gets stopped and manages to talk her way out of it. What's your best advice for talking your way out of a speeding ticket? My friend, Pasha, sounds a lot like your friend—he can charm anyone with half a smile. God only knows what happens when Pasha unleashes a full smile. But for the rest of us, I think the best approach is being as polite and apologetic as possible. From my experience around nobility and other people in power, they like to feel like they are in charge. Then, if they decide to let you off from whatever it is you've done wrong, they feel proud of their magnanimity. Do I manipulate their desire for power and self-congratulation? I admit it. And yet it works, some of the time, and so I'll keep doing it. I hope that helps you a bit. I want to invite my friend to prom but another guy invited her sooner and she agreed. I think she likes me better though and would prefer to go with me. Do you think I could still get her to go with me instead? I kind of want to do something dramatic. What should I do? I fear you're vastly underestimating the strength of your love interest's conviction. You claim that she'd rather go with you, but you completely ignore the fact that she said Yes to someone else. I'm sorry to break it to you, but I think this is evidence enough that she is perfectly happy attending the prom with her date. Of course, my experience stems mostly from Vika and Renata. Those two girls know what they want, and if a boy were to tell them they believed otherwise, he would justly deserve the tongue lashing (and in Vika's case, magical punishment) that he received. I do suggest you respect your love interest's expressed desire to attend the prom with her current date. But do not despair—there will be other opportunities for you in the future. Just remember to be a little quicker on the draw the next time. I love reading but college is making me hate it. I'm constantly forced to read boring textbooks and books I hate, and it leaves me with no time to read the books I want. I now haven't read anything of my choosing since the semester started. Advice? Unfortunately, we are sometimes required to do things to which we object. It may be magically re-shelving books in the middle of the night from outside the library, or it may be studying inside the library itself, reading texts that bore you to death. Either way, what must be done, must be done, and I find that the best way to get through it is with the intense conviction that it will pay off someday, whether in a predictable manner or not. For example, my mentor put me through all sorts of torturous training, like the time she locked me in my bedroom with wild, man-eating animals. I certainly didn't like it—in fact, I objected vehemently—but I also knew that the quickest way to get out of the situation was to propel my way through. Now, I realize this may not have been the advice that you wanted to hear. But what you ought to take away from this is that everything you do makes you stronger, and someday it will pay off. Keeping this kind of optimism is what kept me going. I hope it helps you persevere, as well. Someone at work keeps stealing my food, even though it's clearly labeled with my name. I work on a floor with literally hundreds of people, so I couldn't even begin to guess who is doing it. Sometimes they don't take all of the food, but I can still tell that someone has touched it, and that really grosses me out. Buying lunch is too expensive though! What should I do? Have you considered poisoning the food to trap your adversary? Perhaps just enough to make them ill? What do you guys think of this new feature? Who are some characters you'd like to get advice from? Remember if you would like to submit your own questions to be used to in this feature, fill out the Google form or simply leave a comment below! This is all kinds of fab Brittany! I don't remember The Crown's Game very well but I like the way Nikolai thinks. Simon would be a fun one to get advice from! Thank you, Amber! I'm so excited that I can finally launch this feature. What a creative feature, I love it! I cracked up at Dark Nikolai's food poisoning suggestion lol I can't wait to see more of these! I'd love to ask advice from Shazi (Wrath and the Dawn) or Audrey Rose or Thomas (Stalking Jack the Ripper)! Thank you! That was my favorite reply haha. This is hilarious! I love this idea. Now I'm off to think of a question I need answered so I can submit to a future post. If I could get Nikolai Lantsov to do one of these I'd probably pass out into a mess of feels haha. Thank you for stopping by! I hope you enjoy your reread of The Crown's Game. Yes, you do! It's a great book and one I HIGHLY recommend. You're the sweetest, thank you so much! I'm glad you enjoyed it. And, you really need to read TCG, you're missing out! So fun!! I need to read Crown's Fate still and this is making me want to kick it up in my TBR. 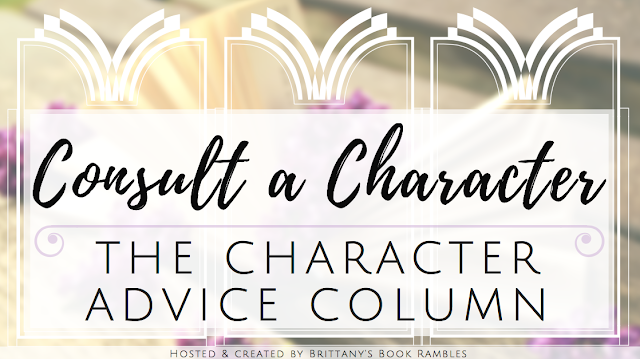 I look forward to reading your future character advice columns! Haha, this is such a fun new feature! I love it! I LOVE THIS. Super fun, Brittany!!!! Thank you, lovely! I have been so excited to finally launch this one. Such a great and fun post. Plus I love the advice... especially the food stealing one! ROFL! Hahaha so glad you loved it. Honestly, Nikolai's response is like the *most* Russian response ever haha. This is an awesome feature! I love that first answer... and the last one too!!! Thank you so much! I hope you'll enjoy the future ones as well. omg THAT LAST ONE. This is the best idea, B! Ahh thank you, Aimee! I hope the future ones make you laugh as well. Thank you, Silvia! I'm really glad I could make you laugh right when you needed it. Hopefully the future posts will have the same impact on you. I love this feature so much!! The last answer is the absolute best, but TBH I love them all. This may actually be THE most clever thing I have seen in my entire blogging career! I. LOVE. THIS. And these even sound like Nikolai responses, which is even better! I need to think of some questions to ask characters, because this is freaking GENIUS, dude! Why, thank you! As we have already discussed in DM, Nikolai was able to provide his insight via Evelyn Skye haha. I hope you enjoy the future posts for this just as much. This is such a fantastic idea! How fun!! Love Nikolai's advice---though I think I'll avoid Dark Nikolai's. This is such a fun feature! The last one is hilarious! I don't even know who I'd want to get advice from, but I definitely look forward to seeing who gives their advice in the future!